985 High Bridge Portage N.Y. 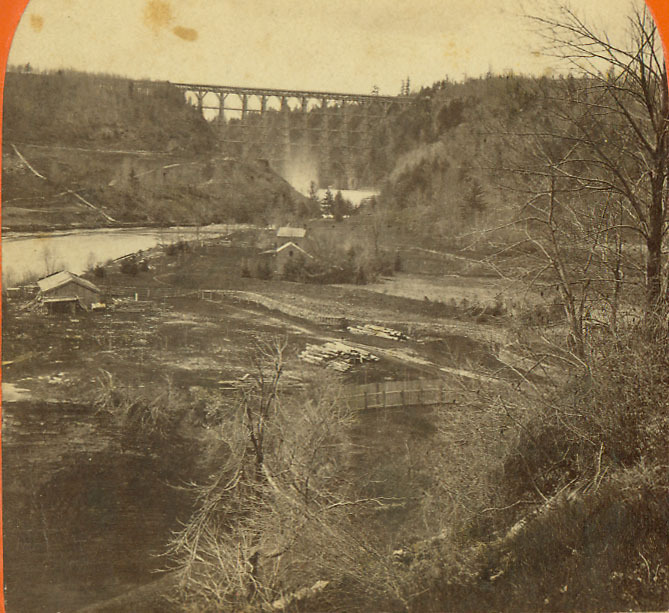 Although Soule may have been after a view of the famous Portage Bridge, he actually provided us with a good image of the area between the Middle and Upper Falls not long after Mr. Letchworth arrived. Evidence of both farming and logging activities are visible in the photograph. The Portage Bridge, Upper Falls, and the Genesee Valley Canal can also be seen. The Canal is the horizonal light line to the left of the Bridge, about half way down the river bank. See Image 27 for a later view of the same area. A larger view of this image is found below.